In a university absolutely brimming with community engagement initiatives of one kind or another, one faculty stands out for the length and breadth of its programs’ reach. In the 2008-2009 fiscal year, nearly 17,000 people took part in McGill Science outreach programs. That number includes visitors to special public events at the museum, its popular lecture series, the Freaky Fridays series, the Sunday Science Documentary film showings, a series of talks aimed at Science support staff (STARS) and much more. But the programs that organizers are most proud of are the two that take our show on the road to local schools: Hands-on Science in the Classroom and Cool Science/Hot Talks. 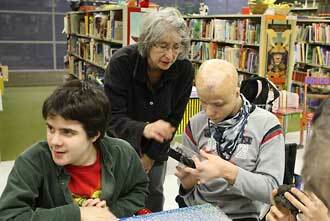 The two programs combined to educate more than 3,000 Montreal-area students last year. The Hands-on initiative sends trained educators from the Redpath Museum out to schools and libraries with dinosaur bones and Ordovician fossils, volcanic rocks, unusual sea shells and skeletal material to inspire children to study science and appreciate the wonders of real natural objects. In the past year, 36 different Hands-on sessions were presented at 14 different venues. Hot Talks, meanwhile, sends McGill scientists to area high schools and CEGEPS to introduce local teens to cutting-edge research and help them cultivate an appreciation for science concepts, concerns and issues like climate change and alternative energy. Ingrid Birker is the Science Outreach Co-ordinator for the Faculty of Science and the Redpath Museum where she is based. The Markham, Ont., native who came to work at the Redpath in 1980 says science outreach is more crucial now than ever. Cost and time pressures make it extremely difficult for teachers to organize field trips these days, especially at the secondary level. Renting buses for trips costs schools money they don’t have. And with all the teaching requirements that must be crammed into regular school hours, there is very little time for extracurricular activities anyway. “Before the reforms there was an interest in coming to the Redpath Museum, and there still is, but now teachers are calling us to come to them. That’s sort of the reality of the situation now. So by going out with these presentations we’re really filling in an educational gap,” Birker said. the University also benefits from the exposure the programs bring.